Jerome cat is Stumpy's sister. 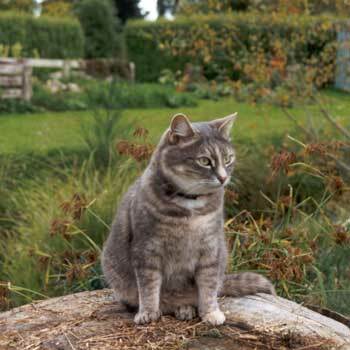 She is a champagne and grey cat with very subtle stripes and a spotty tummy. Jerome is named after Jerome Kersey, a basketball player in the NBA. She is inclined to be an introvert, but has huge outpourings of passion and love for the dog. Visitors can frighten Jerome unintentionally and she often finds cat hiding places in strange rooms or cupboards, inevitably getting herself shut in. Jerome is really a cat of extremes. At shy times she'll run and hide. Passionate moods mean claws, howling miaows and ferocious head-butts and smooches. If the gardener is the object of affection, then beware! Jerome the cat will jump on backs or shoulders (ouch!) or get totally in the way of the trowel or shovel. 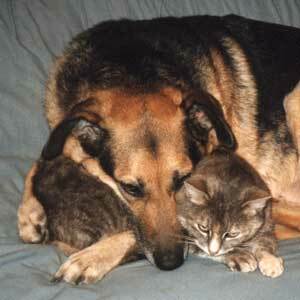 Jerome the cat loves the dog, passionately. If he's relaxing on a chair, she'll jump up to join him. If he's just standing around she'll be under his chin or rubbing against his legs. She cleans his eyes and ears. When he's asleep she'll have moments of extreme passion and start kneading him in the stomach with her claws. They are best friends. I wonder if Jerome knows that the relationship is one-sided? I think that Taj-dog could definitely take it or leave it - try snoozing with a passionate cat bugging you. I've never seen Taj-dog wandering around the house desperately seeking Jerome, but I've often heard him sighing and groaning when she's found him and the claws are connecting. Jerome is always excellent cat company and will accompany the gardener to the four corners of the property. Dried cat food in the gardener's pocket is just an added extra. Jerome is by far the best participant in the twilight cat-walks. 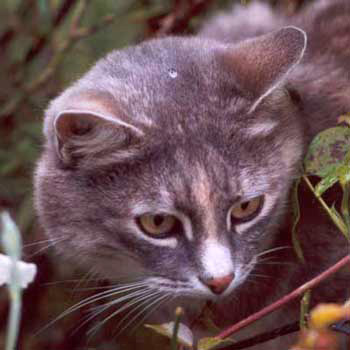 She always goes the distance, miaowing constantly, often racing ahead. On these walks she is fearless, and shows the most stamina of all the cats. She keeps up, and never seems to get stuck (bridges are no barriers to her). 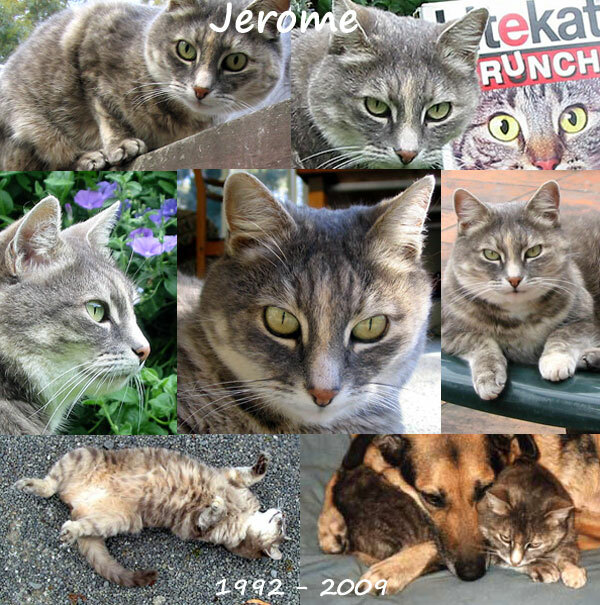 Jerome was buried in the Hazelnut Orchard in November 2009. She had an untreatable tumour, and went for her final vet's visit on the 25th November. It was an easy decision. Love you, Jerome. Enjoy your memorial tree - a weeping Silver Pear.